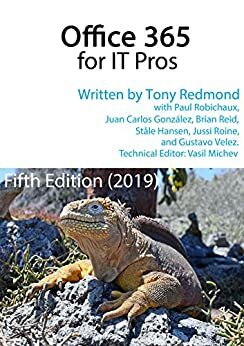 The Office 365 for IT Pros writing team is thrilled to release the 10th update for the 2019 edition. Dated January 21, 2019, the updated files are now online and available on Gumroad.com (for subscribers who bought the EPUB and PDF versions) and Amazon (for those who bought the Kindle version from Amazon). Please see our FAQ for details about how to download the updated files. As always, details of the 16 chapter changes made in the January 2019 update are available in the Office 365 for IT Pros change log. We continue to process changes as we track developments inside Office 365 and expect that the same level of chapter changes will appear in future updates. The volume and type of changes made to a complex cloud application suite like Office 365 underline the value of the ePublishing model, especially when the updates are fully integrated into the body of the text. You don’t have to cut and paste anything to see fully up-to-date content. Four years into this ePublishing journey, we’re still a little baffled when subscribers don’t download updates. Roughly 40% of our subscribers download new files in the month after updates are made available. Perhaps our update notifications are considered spam and never appear in inboxes, or perhaps everyone is so busy trying to keep up that they never get around to downloading the updates. In any case, we encourage subscribers to download updates as soon as possible so that you have the latest information available to you. It is always so difficult to find the link to the updates. Perhaps that is why so few people download the updates. Right now, I am still looking. Hi Art, we have documented guidance in our FAQ https://office365itpros.com/faq/ and we keep that FAQ updated as new suggestions are made to us. In a nutshell, you should go and log-into Gumroad to the account you created when you first bought the book. You can always get the latest updates from your account. Or if you kept the receipt, use the View product link in it to download the files. Hi Tony, my two cents. First, the book has been incredibly helpful so thank you for that. As for the updates, it would be helpful if you included a link to Gumroad in the email that goes out about the update or on this page (and not in the picture on the left) instead of putting it in an FAQ where it isn’t the first question. I never remember the name of the site is Gumroad, there’s nothing about that I can remember to associate with this book which is why I don’t rush out and download right away. I always know I’m going to have to dig through some information like a bunch of FAQ questions or old emails to get it updated. It isn’t that it’s complicated, it’s just enough of a pain that I don’t do it right away and often I forget about it. Reasonable point. Let us see how we can improve the FAQ. OK. FAQ updated. Let us know what you think. Thank you for adding the link to the email. That made it much easier for me to update my copy this month. Appreciate it! Tony. Is There An Affiliate Link Available For Referrals To This Book? You mean like https://help.gumroad.com/gumroad-affiliates? Yes, Gumroad has an Affiliates program that we could use, but we don’t so far. We’d have to be sure that any site that we signed up was aligned to the book. I Would Like To Set Up A Landing Page Just For The Book 🙂 It’s A Great Book And I Think More People Need To Know It’s Available. It Has Helped Me Tremendously. Go ahead… and point to the book purchase page and we’ll see about making you an affiliate. Hi – I’ve got trouble trying to get hold of the update. Gumroad no longer recognise my account so I can’t login to get hold of the update. While I appreciate this is likely to be gumroad’s problem there is no way of contacting them on their website. So what do I do – I’ve paid for a product that I can no longer get updates for? The support email contact has sorted it out – thanks. Apparently I never had an account (most don’t according to Gumroad support). They supplied the link that took me to the update. That response is kind of odd. We have thousands of customers with Gumroad accounts… It’s the only way to get updates.